Spider-Man must lead his team of teen heroes against the greatest assembly of super villains the world has ever seen! Season Two of the hit series ULTIMATE SPIDER-MAN continues as Spider-Man goes toe to toe with the Green Goblin’s greatest mistake, the menace CARNAGE! Can Spidey and Norman contain the monster before it’s too late? Special thanks to the guys at Big Ben's Comix Oasis in Allen Park for taking the time to do this every week. Ciji Thornton is just your normal everyday woman — if your normal everyday woman operates a fighting robot and plays video games for a living. The show is basically a combination of giant Rock ’Em Sock ’Em robots and real boxing. Each of the 12 robots is operated by a two-person team. One person, the “robo-jockey,” operates the fighting aspect of the robot, while the other, the “robo-tech,” deals primarily with controls and other aspects. The show also is a takeoff of the 2011 movie “Real Steel,” starring Hugh Jackman. “That was an amazing movie,” Thornton said. “Even though it’s not quite the same, that movie is what got me even more excited for this. Thornton is the jockey for her team and Fazlul Zubair served as the tech person. Zubair holds eight degrees from the University of California-Irvine, including a doctorate in aerospace engineering. Like most of the teams on the show, Thornton and Zubair had never met before they were paired with each other. The teams each were assigned a robot at the start of the competition rather than spending the resources for each to build their own. According to its official biography, “Drone Strike” is based on bleeding-edge military hardware, and features stainless steel armor laminated with ballistic nylon in a digital camouflaged pattern. The midsection includes shock-suspended armor bands that completely encircle the critical valve and hose assemblies. The large multifunction head/turret pans and tilts, and the barrel weapons are devastating to opponents. “Drone Strike” is one of the stronger robots on the show; however, due to the heavy armor included for protection, it lacks the mobility and speed of some of the other robots. The show is set up with the robots fighting in a bracket-style tournament. Team Drone Strike went up against Team Robo Hammer in the first round Tuesday night, and came away with a first round knockout when Thornton landed a blow that ripped several actuators and hydraulic hoses out of Robo Hammer’s midsection. 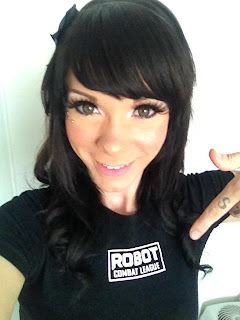 Team Robo Hammer members are electrical engineer Saura Naderi, the tech, and mixed martial artist Amanda Lucas, who is the open weight champion for the Japan-based mixed martial arts league “Deep,” who is the jockey. Lucas also is the daughter of famed film director George Lucas. Thornton said that because Lucas’ dad appeared on the show, Team Robo Hammer got some extra practice time, and a bit more screen time than the other teams. Then, after the qualifying rounds, the two robots were seeded sixth and seventh, pairing them with each other in the first round. “I was so excited,” Thornton said, adding that fighting was the highlight of the experience. Thornton and Zubair will advance to the second round of the competition, with the ultimate prize being $100,000. Thornton didn’t realize what she was doing when she first applied for the show. She responded to a craigslist ad that asked for “people with a competitive mindset.” From there, she went through the process of getting on the show. After she responded to the ad, Thornton was invited to the interview process. “I had to talk to people on the phone, test in front of the camera and answer a lot of questions,” she said. “They were looking for someone with personality, a good back story and that is comfortable in front of the camera. The network didn’t have to worry about Thornton shutting down on camera; this was far from her first time. Thornton was on another SyFy show, “WCG Ultimate Gamer,” in 2008, and also on “The Tester,” which aired online on the Playstation Network. She also starred in her own Web videos, which she posts to her YouTube stream under the name StarSlay3r. StarSlay3r also serves as her gaming tag when playing online and in some tournaments. Thornton has been competing as a gamer since 1998 on games such as “Dance Dance Revolution” and various fighting games. Her big break came in 2006 when she became one of the best “Guitar Hero” players in Texas by placing in the state tournament. It was getting a computer with a processor that could play games that turned on the competitive edge, though. “Robot Combat League” airs on the SyFy channel at 10 p.m. Tuesdays. For more information on the show, check out its website, syfy.com/robotcombatleague. Follow Thornton on Twitter @StarSlay3r or on her website at starslay3r.com. his creation, the "Scare Bears." ALLEN PARK — More than 250 people showed up for the first of four local comic book shows. The first King Kon of the season was held Saturday at the Masonic Lodge, 17212 Ecorse Road. The small show featured many vendors that refuse to attend larger shows, making access to their comics and other pop culture-related items a rare occurance. The show also featured Dirk Manning, the writer and creator of such independent books as "Tales of Mr. Rhee," "Love stories About Death," and "Nightmare World,” who signed autographs. Manning's works are generally published by Image or Shadowline Comics. Tony Miello, the Downriver author and creator of "Gapo the Clown," also was at the show, along with many other local and independent comic book writers and artists also attended. The show will be back at the lodge June 16, Aug. 3 and Nov. 16. Ron Henderson shows off a blue Snaggletooth action figure. "Star Wars," is one of the rarest figures produced for the film. The figure in his hand is worth about $150. of Big Ben's Comix Oasis in Allen Park.